﻿ Best Price on Residence Turquoise in Gosier + Reviews! 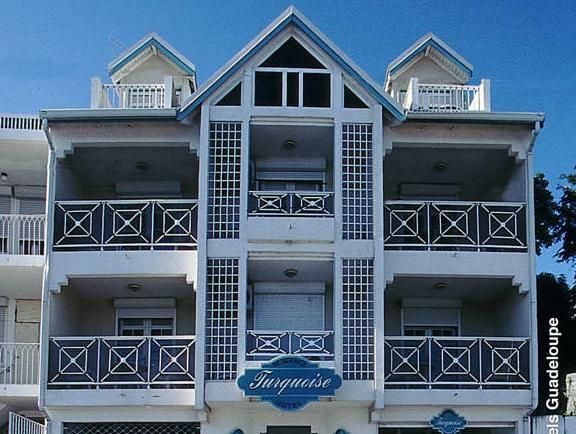 This quaint, tropical-style hotel is located on the island of Guadeloupe and is only 1312 feet from Le Lagon du Gosier Beach. Residence Turquoise offers free Wi-Fi and spacious apartments. Each apartment and suite at this property comes with a fully equipped kitchen, a living area and a balcony. Guests also enjoy air conditioning and a cable TV. There are numerous restaurants and bars located within 1.2 mi of the property, including many that serve international cuisine. There is market located within 5 mi for guests who want to cook at home. The historic Fort Fleur d'épée is 3.1 mi away from Residence Turqouise, while guests will find a small shopping center within 1640 feet. Pointe-à-Pitre International Airport is a 15-minute drive away. Please note that the property will pre-authorize the total amount of the reservation 7 days before arrival. Front desk is open from 09:30 to 12:00 and from 17:00 to 18:00. If expecting to arrive outside check-in hours, contact Résidence Turquoise in advance with the contact details provided in your confirmation. Please inform Résidence Turquoise of your expected arrival time in advance. You can use the Special Requests box when booking, or contact the property directly using the contact details in your confirmation.